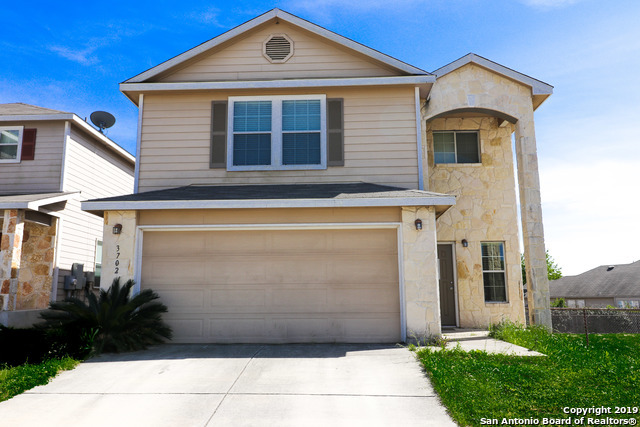 All BULVERDE VILLAGE homes currently listed for sale in San Antonio as of 04/24/2019 are shown below. You can change the search criteria at any time by pressing the 'Change Search' button below. "**Special Financing Terms Available! Skip The Lender Fees & Save Thousands With Zero Plus Loan Options Exclusive to KW Listings. Call Today For More Info! *** Expansive 5 bedroom, 3.5 bath home in the sought-after Bulverde Village Community. Thoughtfully appointed with soaring ceilings, wood flooring, and rock wall accents. Main level features owners' suite, island kitchen with granite counters, formal dining, office, and breakfast area. Spacious game room and media room upstairs." "The stunning greenbelt view is just the start of what makes this beautiful home so endearing. Dual master bedrooms (one down, one up) make this home accessible and comfortable. Open floor plan with 2 living areas, 2 dining area and an island kitchen with a beautiful feature wall in in the main living area. Spacious game room upstairs. Desirable NEISD school district. NO CITY TAX. Active HOA/POA that hold several social events throughout the year making it easy to meet neighbors. Schedule your sh"
"Stunning 4 Bedroom + Study & GameRoom + 3 Car Garage Gehan home in The Point at Bulverde Village.Open concept floor plan boasts soaring family room ceilings,abundant natural light & floor to ceiling rock fireplace!Chef's delight island kitchen w/ built-in stainless apps,gas cooking,& granite.Freshly Painted! Unwind under your covered patio & level backyard w/ plenty of room to play. Spacious Master suite DOWN w/walk-in closet.No city taxes.Acclaimed Comal ISD.Walk to Indian Springs E.S.Community"
"INDIAN SPRINGS HOME. WOODEN FLOORS THROUGHOUT MAIN LIVING AREA,10FT CEILINGS WITH CEDAR EXPOSED BEAMS, 8FT DOORS, IRON STAIR SPINDLES, TALL FIREPLACE,GRANITE, ISLAND KITCHEN HAS GAS COOKTOP,STAINLESS APPLIANCES,NEW MICROWAVE,BREAKFAST BAR & BREAKFAST AREA.SEP DINING ROOM.MEDIA RM UP. LOTS OF SPACE! COVERED PATIO,SPRINKLER SYSTEM,BEAUTIFUL LANDSCAPING.EXTRA STORAGE IN GARAGE.WATER SOFTENER." "This beautifully maintained home is the perfect opportunity to live in this highly sought-after neighborhood. Top-ranked NEISD schools, friendly neighborhood atmosphere & amazing amenities (pool, volleyball, basketball, walking trails, parks, pavilion, etc). Lg game rm and 4 bedrooms upstairs, with a full bed/bath down that would be an ideal guest suite or office. Lot is largest in BV, & the enormous backyard/deck have infinite potential! This house is a must-see! OFFERING $500 PAINT ALLOWANCE!!" "With an open floor plan full of natural daylight, soaring ceilings, and a kitchen perfect for entertaining, this home will exceed your expectations. Granite counters with an oversized island flow into the spacious living room. Upstairs you will find 3 bedrooms and 2 full baths. The loft area has endless possibilities to meet every need. The covered porch is perfect for a BBQ. Close to newly constructed elementary, neighborhood pool, and play area. The solar panels provide many savings!" 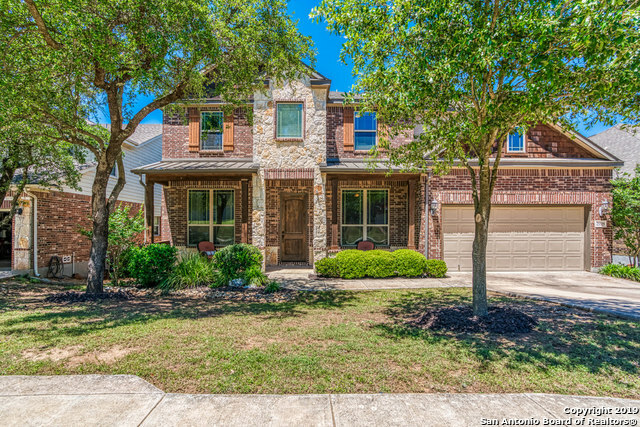 "STUNNING hill country views come w/this wonderful family home.Open floor plan and high ceilings throughout the home.Sep dining rm.BIG kitchen w/gas cooking, zodiac counter tops, custom cabinets, breakfast bar and walk in pantry.Beautiful wood looking ceramic tile throughout first floor. THE VIEWS can be seen from the kitchen, family rm and master bedroom.Lg Master w/HUGE walk in closet.Master bath has double vanity, sep shower/bathtub.Laundry rm down.3 bdrms up. Great Game Rm plus Loft up." "Built in 2006, this San Antonio two-story corner home offers a loft, a fireplace, and a two-car garage. Upgraded features include overall fresh interior paint and newly installed carpet. This home has been virtually staged to illustrate its potential! Thanks for viewing! This home comes with a 30-day buyback guarantee. Terms and conditions apply." "Move-In ready 4 bedroom 3 bath home in highly desired Bulverde Village! The first floor offers open floor plan guest room w/full bath & office! Family room has a ceiling-height brick fireplace and opens to dining room & kitchen. The kitchen provides granite countertops, SS appliances & plenty of storage! Master & two secondary bedrooms upstairs & HUGE gameroom! The master retreat offers tray ceilings, crown molding, double vanities, garden tub & walk in closet! Large backyard! Top rated NEISD sc"
"Charming move-In ready home located in highly desired Creek Haven in Bulverde Village! This spacious home features two living areas, open floor plan & fresh exterior paint! The master suite has tray ceilings w/crown molding, double vanities & walk-in closet! The kitchen features granite countertops, TONS of storage & opens to the family room! Perfect for entertaining! The 2nd floor offers a HUGE loft, 3 secondary bedrooms, gorgeous wood flooring & full bath w/walk-in shower! Great NEISD schools!" "SPARKLES! RARE 3 BDRM 3 BATH HOME WITH SECONDARY BR W/FULL BATH DOWNSTAIRS-COULD BE USED AS BEDRM OR STUDY! CROWN MOLDING, NEW LAMINATE FLOORS, GAMEROOM, OPEN FLOORPLAN! ON CUL-DE-SAC: LARGE BACKYARD WITH CUSTON DECK, BBQ PIT, BUILT-IN SEATING AND PERGOLA! PERFECT FOR FAMILY & FRIENDS ENTERTAINING! JOHSON HS & OTHER QUALITY NEISD SCHOOLS NEARBY! WALK TO FAMILY RECREATION AREA TO ENJOY! FAST OCCUPANCY! DON'T WAIT-CALL YOUR REALTOR NOW!!!" "Motivated Seller, Minutes from US 281 and Loop 1604, Minutes from Cibolo Green Elementary & Johnson High! 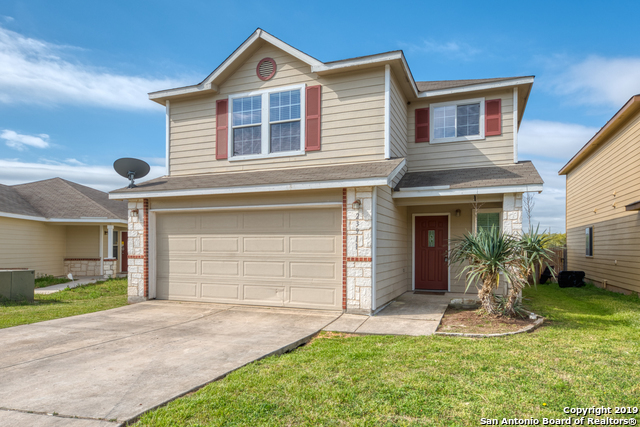 Charming 2 story home located in Bulverde Village! This home features 4 bedrooms & 3 full baths! HUGE Family room! The second-floor master suite offers tray ceilings, TONS of natural lighting! Secondary bedroom located on first floor with a full bath - perfect for guests! HUGE loft can be used as either game room or secondary living! Just needs fresh interior & exterior paint! TONS of potent"